The holiday season is one of my favorite times to spend in my favorite cities… The snow, the twinkling lights, the crisp air… It all feels so magical! New York, Paris, and Chicago all know how to do the holiday season right, but now that I’m in Chicago – let’s focus on the holidays here! If you had 24 hours in Chicago and wanted to pack as much in as you could, here’s my suggested agenda! I teamed up with Express to show just how easy it is to take one single outfit from day to night, that transitions from each of my four favorite holiday activities with just a few accessory swaps. The foundation of your day full of different looks revolves around a chunky-looking turtleneck sweater and a fabulous pair of coated jeans. (We all know how I feel about Express jeans!) 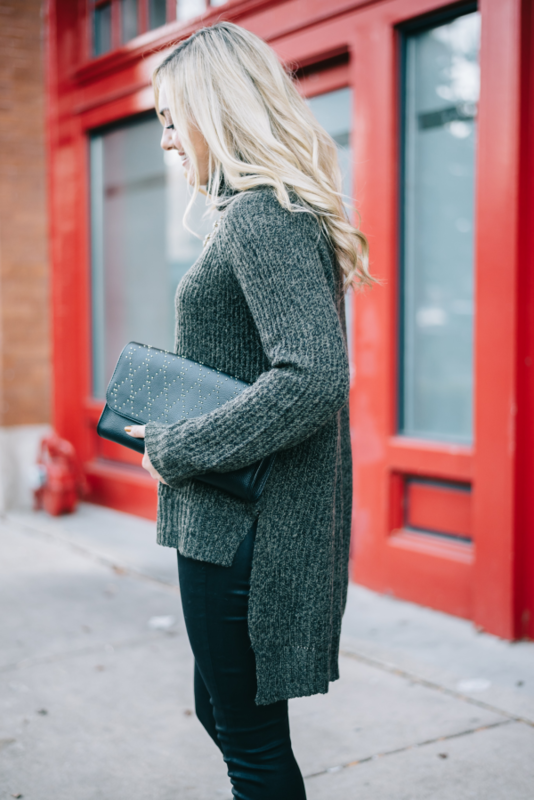 This turtleneck sweater is literally perfect… It’s not too thick, but not too thin either. It’s the ideal weight to wear for a long day of exploring a city, especially if you’ll be in and out of stores and restaurants. I love how it’s longer in the back, too! If you typically aren’t comfortable wearing coated jeans without a longer top, this sweater has you covered, quite literally. 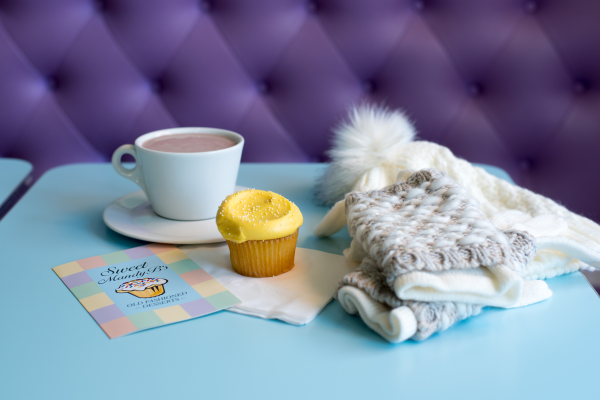 Start the day off with a sweet treat and some shopping! Lincoln Park has long been one of my favorite neighborhoods in Chicago (it’s actually where I lived for a year after college! ), and it’s one of my favorites because it truly feels like a neighborhood. Gorgeous homes, great shopping, and a lot of quaint places to grab a quick bite. My absolute favorite bakery in Chicago is Sweet Mandy B’s. Start the day there grabbing coffee, hot chocolate, and sweet treats for some much-needed fuel! 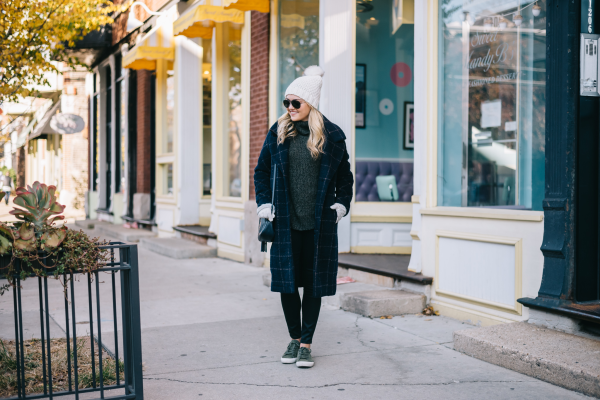 It’s December in Chicago so you’re going to want to bundle up! I’d recommend wearing a chic pair of suede sneakers to stay comfortable and a great printed jacket. (Bonus points for the longer length of this windowpane printed coat from Express!) 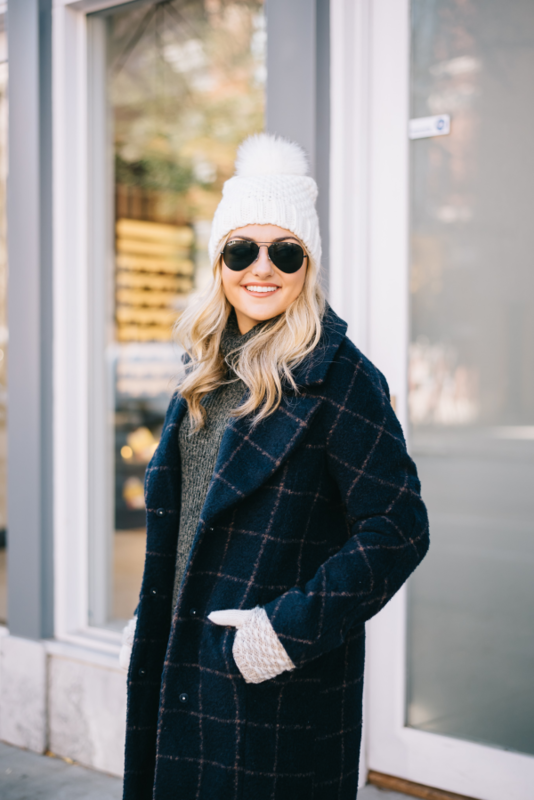 Add a faux-fur pom-pom beanie and a pair of warm gloves while you’re walking around outside. 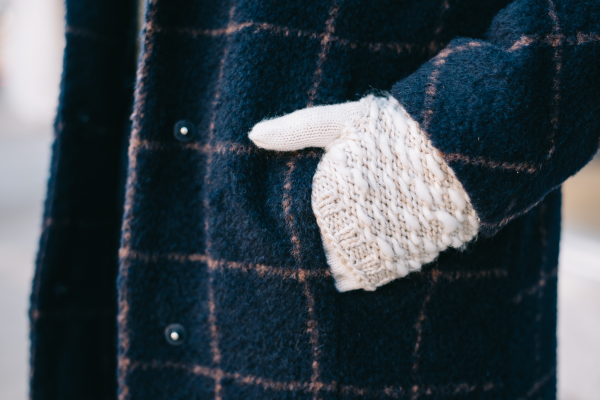 I’m absolutely in love with these Express gloves… The gloves and hand warmers are separate so you can wear either individually or wear them together for extra warmth! Once you’ve walked around and burned off your calories from hot chocolate and pastries, head back to where you’re staying to drop off your purchases and get ready for dinner. 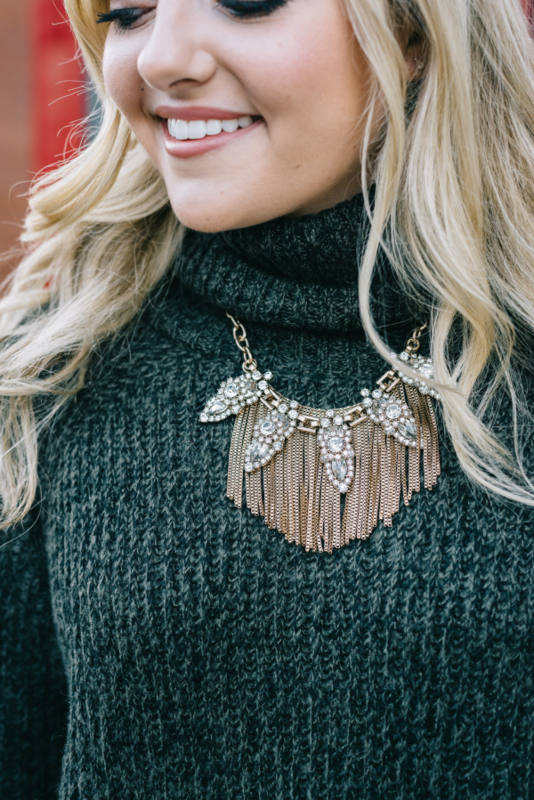 For dinner, shed your layers and just add heels and a statement necklace. That’s all you need in Chicago! I’d highly recommend dinner in the West Loop! It’s a super popular area right now and just about every restaurant off of Randolph has opened in the last 2-3 years. (I’d also highly recommend making reservations! These places book up pretty quickly.) However, if you forget to make a reservation, there are a ton of really great spots packed into a few blocks. Some of my favorites include: Bar Siena, Maude’s, Au Cheval, Blackbird, Avec, Vivo, Nellcote, The Publican, Green Street Meats, and RM Champagne. Post-dinner, head to the Loop to Chicago’s Theatre District and catch a show. You can’t go wrong with A Christmas Carol at the Goodman Theatre or The Nutcracker at Auditorium Theatre! It’s a quick cab ride from the West Loop to the Chicago Theatre… Just head east on Randolph! But since you might be outside waiting for your Uber or waiting at the box office, add a super chic faux fur coat over your dinner outfit. Once the show is over, why not cozy up near a fireplace for a nightcap? Since Chicago is notoriously freezing for a good six months out of the year, cozy bars are pretty easy to find. 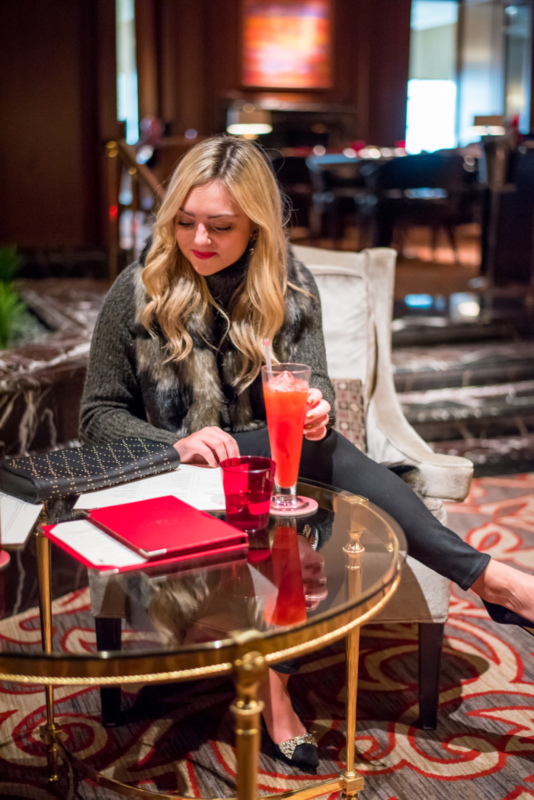 Some of my favorites include; Hubbard Inn, Drumbar, RM Champagne, Scofflaw, The Dawson, the Bar at the Peninsula, Frontier, and The Library under Gilt Bar. 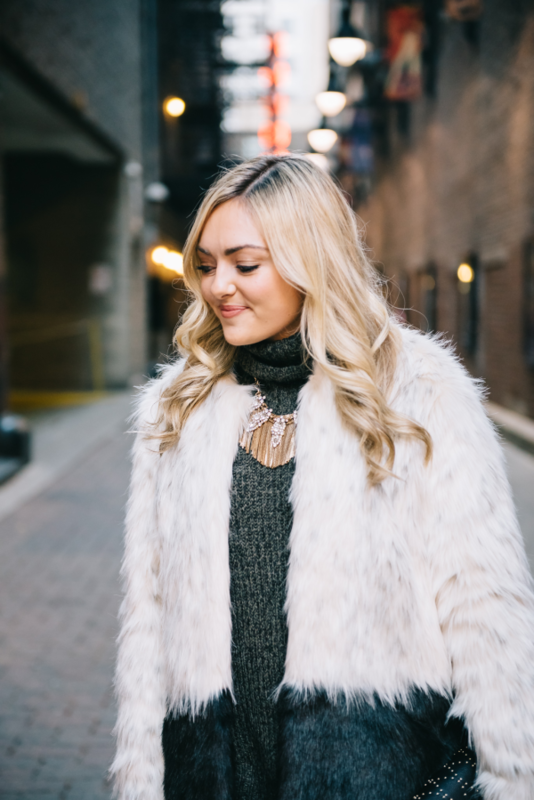 To transition your look from dinner and a show to a night out, I’d simply take off your statement necklace and add a different faux fur accessory. 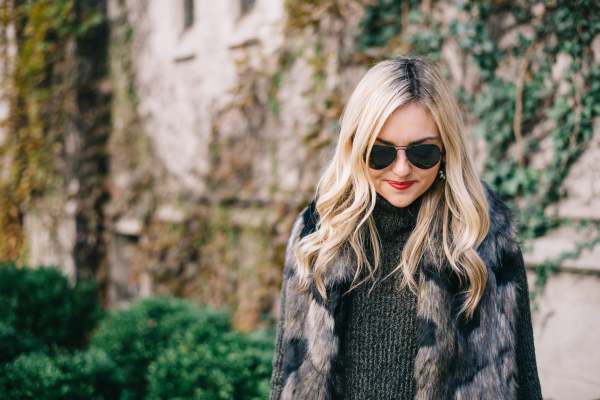 I’m absolutely obsessed with this patchwork faux fur stole… I’ve been wearing it constantly! 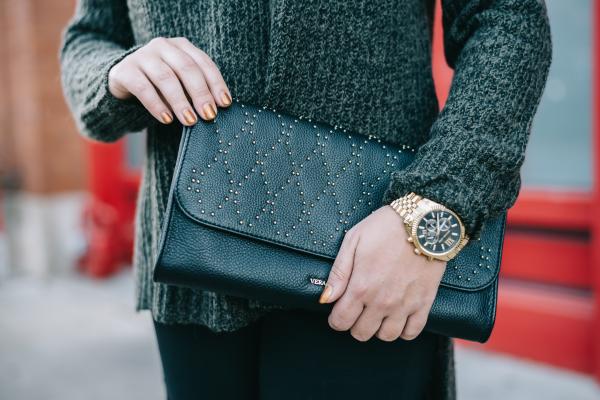 It’s an instant dose of glam. I love how it looks like a faux fur vest from the front, but it’s just a stole. It’s long enough you can wrap it around your neck, too! If you’ve got more than 24 hours, I’d also recommend Ice Skating near the Bean in Milenium Park, or on the outdoor terrace at the Peninsula Hotel. Zoo Lights at the Lincoln Park Zoo is also a lot of fun! Don’t forget to check out my Travel Guide for more spots to check out while you’re in town! Shop my whole City Guide look here! I love each of those outfits! Chicago looks absolutely beautiful, I need to visit one day! Looking so cute in the first outfit and absolutely elegant and glamorous in the other two! Beautiful! Loved this post! It’s always fun to see and share favorite spots around the city! Your fur coat is such a wonderful piece! Flawless! I love your transitions. Would you mind to share your nail color? Your makeup looks so fresh and pretty. Obsessed with all of these looks! That check coat is my favorite though! I love the gray turtleneck, especially with the gray vest. So perfect! Seriously cannot get over the vest. Thanks for the great tips! Definitely need to get to Chicago ASAP! Loving those sparkly bow heels! Beautiful photos. I couldn’t agree with you more that there’s something so magical about the city during the holiday time….especially when there are flurries in the air and horse rides….ahhh I love it! This makes me so excited for the holiday season! I love all your looks! 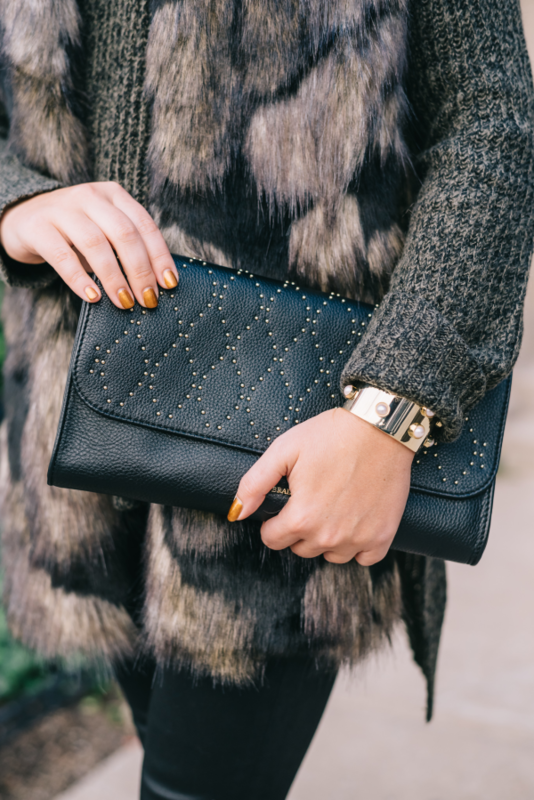 Love how fur designs like the coat and vest are able to glam up the outfit instantly! 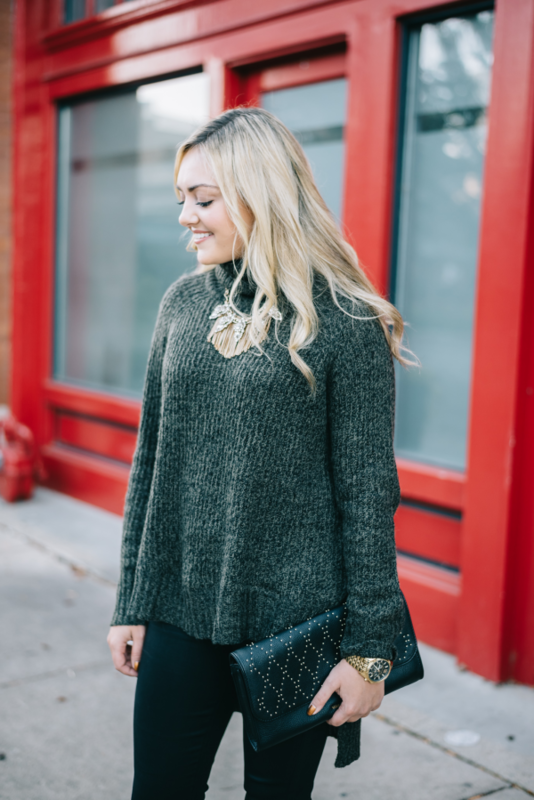 The hi-low hem of the sweater is so chic too! I love Sweet Mandy B’s! Armitage is my favorite boutique shopping too – it’s always my go-to for a lazy saturday wandering the shops. I work in West Loop but haven’t had a chance to try all those restaurants, they’re on my list though! These are awesome picks and adorable outfits to go with them – thanks for sharing, from one Chicago blogger to another! Your outfit looks so cosy but fashionable ate the same time! It’s perfect for autumn/winter season. 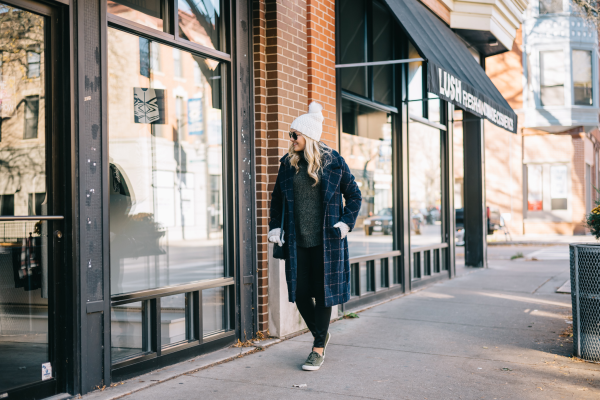 I love Chicago but tend to schedule my visits during the warmer months, although this post has me wanting to visit in the winter! Love all the outfits, super cute!